Melted 200g 70% dark chocolate and left to cool slightly. Creamed 170g unsalted butter with 350g soft brown sugar until my arm was incapable of beating any more and the mixture was light and creamy. Beat in eggs yolks from 3 large eggs (reserving the whites for later use). Sifted in 370g flour (20g quinoa, 175g wholemeal, 175g white), 1/2 tsp baking powder, 1/2 tsp bicarb of soda and 1/2 tsp salt. Stirred in 250g Greek yogurt and 250g water. Whisked eggs whites until soft peaks formed then folded into the batter with a metal spoon. Divided between two 22cm cake thingies and baked at 180C for 30 mins. Melted 100g 70% dark chocolate and 100g 35% milk chocolate with 30g unsalted butter then stirred until smooth. Put 50ml water, 2 tbsp golden syrup and 1 tbsp cocoa in a pan. Gently heated and stirred until mixture was smooth. Stirred this into the chocolate together with 100ml double cream. Left to cool completely then used half of the mixture to sandwich the two cakes together and spreading the remainder on top. Decorated with little gold stars. For once nothing went wrong with this cake and with four bars of chocolate in it, I was mightily relieved. It turned out as good as I could have wished for – in fact I was particularly proud of this one. The cake disappeared as soon as it was cut into and I only just managed to save a couple of pieces for the host and hostess – it obviously wasn’t big enough after all. Luckily, a friend saved me a bit of her slice or I would not have been able to verify that it was indeed as good as it looked. Those little gold stars are so pretty Choclette and the cake looks magnificent! Another winner! Does the quinoa do something special or is it for nutritional reasons? I am not familiar with it. As you know I made this cake the other week for my daughter’s birthday and it is lovely. I am definitely going to use your fudge icing recipe next time I make a chocolate cake as I tried a chocolate courgette cake with choc fudge icing at the weekend but neither the cake or the icing were a complete success. The stars do look very elegant. is that quinoa flour or just quinoa? I haven’t seen quinoa flour for sale and would it be ok to sub it with a different one or is it essential? Bad idea to look at your blog at 5:30 when I’m not having dinner till 8pm this evening…. Joanna – Thank you for the kind words. I’ve rather taken to those stars too, but when I went to stock up from the place I’d originally bought them from, they had none in and said they never had! As for the quinoa, I just like to substitute it or buckwheat or some other flour for some of the wheat flour so I can kid myself my cakes are healthy. LilaVanilla – thank you. The egg whites are meant to give a lighter texture and they probably do but I’m convinced it’s the yogurt that makes the real difference. Lucie – thank you, I’m quite keen on those stars too. Johanna – the stars seem to be winning this show. Amazing what useful things can be found at the back of cupboards. Kath – I do know you made it and I’m still waiting to see it appear on your blog or at least a picture??? Sorry to hear about your courgette cake, now worrying that it came from me – hoping to hear more about that one too. Kate – Just repeating what I said above about the quinoa. I just like to substitute it or buckwheat or some other flour for some of the wheat flour so I can kid myself my cakes are healthy. It’s certainly not essential – any flour can be used instead. Hopefully you built up a good appetite for supper. Chele – thanks. So wish I was around to sample your creations. Jac – thanks, I was rather taken with the plate and am trying not feel too sorry that I sent it off with the cake. Am now trawling charity shops for nice things to present cakes on, but sort of wished I’d hung onto that one. Tamanna – glad you liked it. Oh, so pretty! It sounds truly delicious… and it must have been if you had to fight for scraps! There’s no better recommendation than that. Oh no, do you know with the excitement of the day I forgot to take a pic of her cake – that makes me quite a bad mother and a very bad blogger I realise. It was a great cake though. No the courgette cake was inspired by yours and Mangocheeks but I didn’t have the necessary ingredients so got one off the BBC recipe website. Others said they liked it, but I have a feeling they may have been comforting me after a bad baking day. I wasn’t keen on the mixed spice with the chocolate and the fudge icing was a disaster that I just about managed to salvage – but only just. Still bit confused about the quinoa… do you grind it up or just use it as is? Choc just reading your comment about the charity shop plates. Like you I frequently get plates to present food on for people (but you knew that), if I like it a little too much, than I swap it for one I already have. I’m getting an assorted batch of awesome plates 🙂 Scored an art deco green one recently…but that was ‘found’ in my mums cupboard. Oh how I wish it was my birthday in your house, Choclette! Wendy – I was a little surprised how quickly it was pounced on given that there were a massive pile of cupcakes lying around untouched – home made v brought I guess. Kath, a remiss blogger perhaps, but never a bad mother. Keeping your poor daughter waiting whilst you take the perfect picture is perhaps not the way to go. I had a look at the BBC cake before making the one I did and decided I preferred MangoCheeks’ version. Ananda – glad you liked it. FreeRangeGirl – I seem to be quite good at finding excuses to make cake and if I really can’t find an excuse, I’ll make one anyway. Kitchenmaid – I’ve only just started doing this from a recent CityHippy tip, so haven’t acquired much to get attached to yet, but that plate was rather a special one. I buy quinoa flour, already ground, though I have seen recipes where people use it whole. I love chocolate cake…any time. Love all those starts on the frosting…simple and nice. Gill – a tea party with bread and jam from you and cake from me – yum! Celia – thanks. No room for a full on mixer in our kitchen, but I do have an electric hand held beater – just don’t find it’s very good at creaming butter and sugar. Very good at beating eggs & sugar though. Thanks Sushma, this icing was a very good one. MaryHoh – thanks for your comments, I was pleased with the stars. Add my name to list list of people who *LOVE* the stars! 4 bars!!! I’m not surprised it was delicious, the stars are so pretty too. Sushma – thank you, it sounds pretty much like clotted cream, which I used to make but now take the lazy way out and buy. Anon – If I had a name I would – glad you liked them. Janice – good to hear from you. This cake was not for the faint hearted. What a wonderful cake! It’s looks so chocolatey and delicious. I love the little stars on top! I’m very interested in chocolate cake recipes because I’m seraching for the best version at the moment. Danielle – thank you, it was a good one. Les reves – I’ve labelled all the best ones I’ve made “delicious” if you want to have a look at those. Keep thinking I should be a bit more methodical in my rating and do a star system of something. It looks so tasty! I’d like to make it. Thank you for the recipe. That chocolate cake looks so delish. I would love a huge slice now. 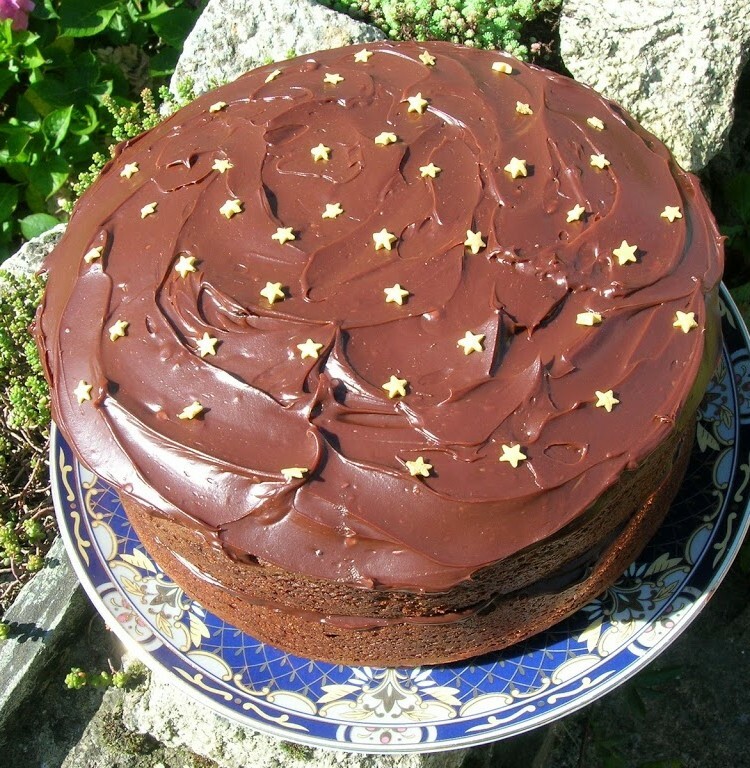 That icing looks awesome and the stars are so pretty – elevates it to a special cake! Raffaella – Let me know how you get on if you do make it. Maria – thank you. A slice now would be very nice indeed. CC – thanks. Just wish I’d bought more of those stars when I had the chance. And speaking of charity shop buys, why don’t you get jumble sales anymore? Is it the car boot that has done for them? Looks like your cake and the frosting turned out beautifully 🙂 And I love the star decoration. Oxslip – now that was a bit mean – cardamom and saffron would have got along fine together! Maybe you need to live in a poorer part of the country – we get loads of jumble sales down here. That icing is amazingly fudgy! So beautiful. That’s a lot of chocolate that goes into the cake. Looks nice. Tis is my dream birthday cake – loving the stars! I like the stars too – sparkling!